The Excipient World 2019 conference program includes sessions for every critical role, preparing professionals to overcome challenges and take advantage of emerging solutions and technologies. Presented by industry experts from some of the largest pharma, biologic and excipient manufacturers in the world as well as the FDA and USP, the education program is a must attend if you want to improve your ability to meet customer demands and stay ahead of the competition. Search the full program to find sessions relevant to your job and industry segment and register to attend. The Excipient World Conference Program provides the most in-depth and comprehensive education program on excipients, covering the entire spectrum of topics for manufacturers of chemically-derived and generic drugs, biologics, biosimilars, OTC, medical device / combination products and emerging sectors such as precision and regenerative medicine. Manufacturing professionals in formulation, operations, R&D, procurement and regulations must stay current on the latest excipient trends, products, technologies, and regulatory changes. 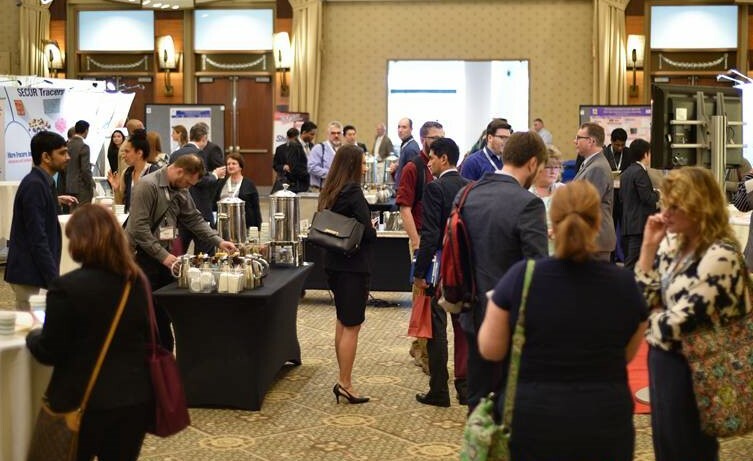 Excipient World’s conference program, expo and networking programs provide all the sessions you need to to meet the demands of the global drug, consumer products and medical device / combination marketplace while advancing your professional careers. Choosing one or several excipients for a drug or biologic product formulation is an important step in development. Consumer demand for cost-effective products, changing regulations, and new excipient technologies must be considered in the R&D process for new drugs and products. A carefully-chosen excipient may reduce manufacturing costs by being multifunctional or may enhance patient experience by offering taste masking properties. An excipient must best suit the intended dosage form of the drug, demonstrate great organoleptic properties, conform to pharmacopeial regulations, be easy to source, and work effectively. The right excipient will have the ideal pharmacokinetic properties for the intended pharmaceutical application. It will also work well with a manufacturers existing equipment or fit into a manufacturing plan. Deciding factors may include the intended use of the compound, the amount of compound needed (grams to tonnage) or environmental conditions that might affect an excipient. Other considerations include potential toxicity, the origin of the chemicals, and other special factors, including using a plant-based excipient over one of animal origin (gelatin). Excipient World’s education program improves the proficiency level and knowledge for all manufacturers using excipients in their finished drugs or biologic products. Excipient World attracts industry experts from pharmaceutical, biologic and excipient manufacturers, government, trade associations and academia. The education program includes presentations, case studies, panels, hands-on and in-depth workshops and poster sessions presented over three days. IPEC-Americas’ selected subject matter experts from the FDA and industry will present quality, regulatory and safety updates in half-day in-depth workshops on the first day of Excipient World 2019. These educational workshops are designed to foster learning and maximize participant engagement in a small group setting. 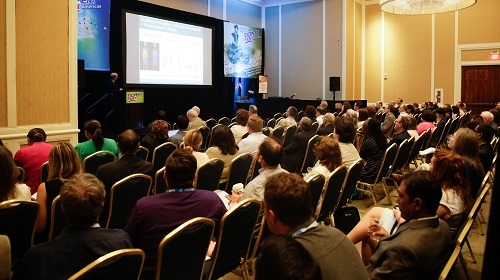 With a wide array of current, relevant, and thought-provoking sessions and numerous opportunities to connect and network, Excipient World 2019 is designed to immerse manufacturing professionals in all things excipient from excipient formulation to excipient delivery systems to regulations and compliance and new excipient and ingredient innovations. Compliance with excipient GMP/GDP is important to everyone involved in the manufacture, distribution or use of excipients, a topic also presented in the conference program. The Excipient World exhibition connects global excipient manufacturing suppliers and the excipient user community to learn about science innovations, new excipients that can be used in formulation and delivery systems, and excipient supply chain and sourcing options. Attendees will have exclusive time and two full days of exhibit hall hours, as well as plenty of networking events to meet with exhibitors and other attendees. A comprehensive array of excipient solutions will be presented in the exhibit hall, including Source, Products, Process, Functionality, Drug Dosage Forms and Finished products. Excipient World 2019 will have an expanded show floor presenting more industry suppliers form around the world than ever before. Excipient World’s conference program will include sessions focused on the evolving global role of excipients. Critical regulations, supply chain issues, and formulation challenges in today’s global economy will be presented during three days of education sessions to better prepare manufacturers to meet consumer demand. Get a ‘sneak peek’ at the quality and comprehensive education that will be presented at Excipient World Conference & Expo 2019. Please fill out the form below to download the IPEC-Americas presentation on “New Excipient Regulations in China and its Impact on Imported Drugs.” And, don’t forget to check back on the website for updates to the conference program as it is developed and finalized! * Your contact information will not be sold and will only be used to send information on Excipient World. In order to access the presentation you MUST check yes below. We cannot process your request otherwise. Thank you for your interest in the education program at Excipient World. Check your email inbox for an email with the link to download the session presentation. Be sure to visit the Excipient World website for updates on the conference program for 2019 at Excipient World. 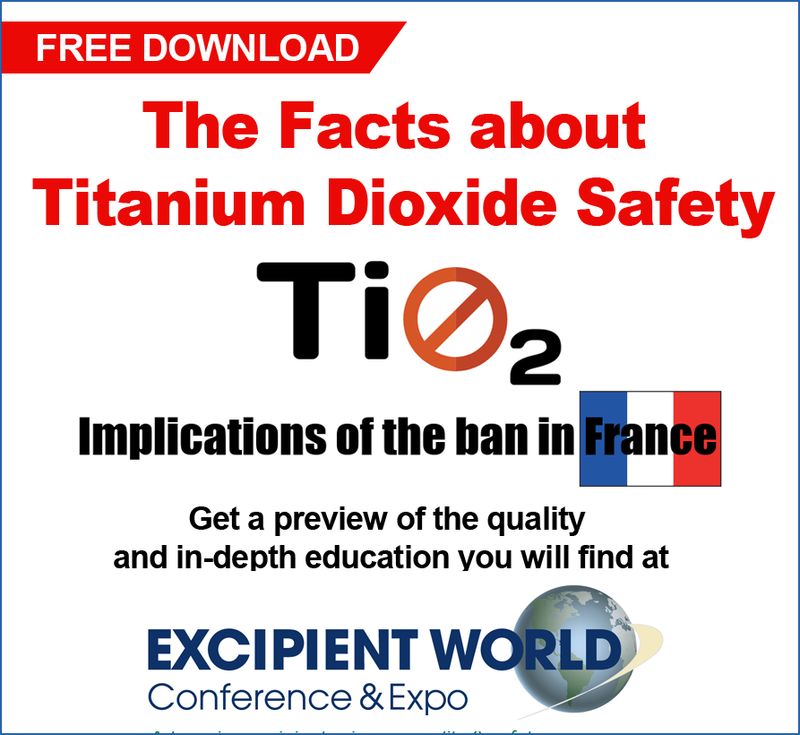 Check your inbox for an email with the link to download the TiO2 session presentation. REGISTER TODAY at early bird rates for the 3-Day Conference Package to attend the in-depth workshops on May 6 and the education sessions on May 7 – 8.